The head still whirls, stepping out of Westend theatre, at Vishal Bharadwaj’s dark, nightmarish yarn about a woman killing off each of her husbands in the search to pacify her lovelorn heart. Through more than two decades of turbulence and rare happiness, Suzzana is aided in her executions by her faithful servants. By the end credits, she is ready to confess all, in a church though. The humour is ink spreading on the blotting paper of betrayal, lust and human ruin. Although seemingly far-fetched as a story, the director paints black, dim lights and overcast gray, twilight-akin outdoors where his characters play out their little comedy. So there is a chauvinistic army man, a drug-addicted rock star and a perverted poet to be bumped off in the first half. In their midst there are allegories – be it the 1984 Operation Bluestar or the 1993 riots. The intermission message says – four more to go. It is post interval that we get more edge in the proceedings, a Russian Spy is made to go down a well, the investigating police officer happens to fall in love with the murderer and goes blind in lust for her. A doctor thwarts a suicide attempt that leads to a chain of consequences. Finally, the narrator of the story meets up with Suzzana, now with silvery, boy-cut hair, and attends her symbolic seventh wedding, that gives away to a dervish-like dance, a culmination of all the haunting visual language the film uses. Not for a mainstream audience, and purely filled with the director’s creative fountain flowing in each frame, 7 Khoon Maaf is a dark comedy, that could have been more fun and crazy. It is still a mesmerising watch for its unique storytelling, throbbing dialogues and mastery over the visual medium. For the die-hard cinema lover. 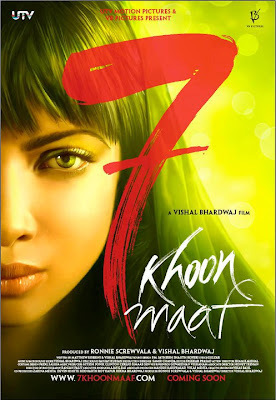 Priyanka Chopra gives her best performance yet of her career, the supporting cast are all competent, especially Irrfan Khan, Naseeruddin Shah, Annu Kapoor and Vivaan Shah. A snow-white cat walks over snow, and not a word needs to be uttered, it is a teasing riddle, a powerful visual punch when solved.